The ETP Mobile Store helps you to reduce queues by creating invoices for the customers as they wait, assist customers in registering in your CRM program or giving them information about their loyalty points, lookup stock and even put away items on a hold bill. This keeps your customers meaningfully engaged and delighted by the in-store brand experience. The retail mobile POS software seamlessly integrates with the other ETP solutions to ensure information accuracy. 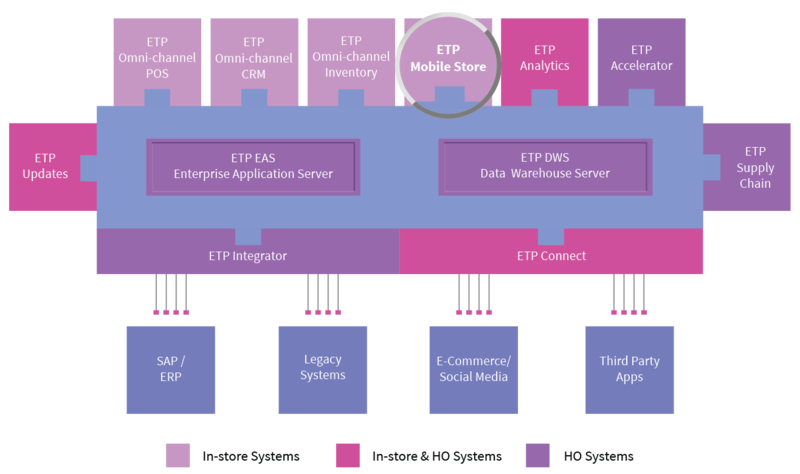 ETP Mobile Store is available for deployment on iOS and Android based smartphones and tablets as an app. The retail invoice can be printed with Bluetooth, Wi-Fi or it can be sent via email using the customer’s email address. The Mobile POS solution can be connected to the ETP Store Operations system within the store on Wi-Fi or, in the case of an atrium or kiosk sale, to the Central Server EAS through cloud computing. The ETP Mobile POS software is developed to facilitate a superior brand experience.